The benefits of having your garden professionally designed are obvious. You’ll have a cohesive, beautiful space at the end of the design process. A good landscape gardener will be able to give you either professionally drawn plans and / or a 3D model before the work commences. This will give you a really good idea of how your finished garden will look. If you choose a professional landscaper who can also implement the build of your garden, they should also give you a realistic timescale of what will happen when. They’ll be able to breakdown the various stages, as well as any payments which are required up front, so as to manage your expectations. Of course, one of the biggest benefits of choosing a professional garden design and build company is that they will ensure that your finished garden is safe and sound. Water features, for example, need to be structurally sound, as do the likes of pergolas and retaining walls. Garden design and implementation can be quite different, particularly when it comes to planting. This is why it’s important to use a garden landscaping company who can both design and build your new outdoor space. For example, a professional garden landscaping company will have extensive knowledge of local soil conditions, amounts of light and shade in the garden and the best type of plants to use. The plants won’t just have been picked on colour complementation and visual form, but also because they will grow well in the space available. With these factors in mind, why not choose a garden landscape company who can both design and implement the build of your garden? 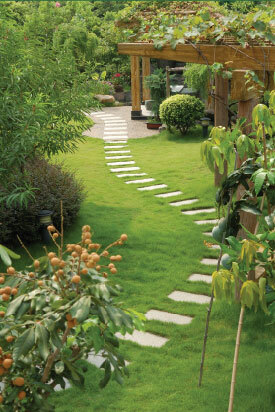 This way, you’ll get the complete garden design package. For gardens in Upminster, Brentwood, Orsett and Hornchurch, D&G Garden World can both design a beautiful space for you and carry out the landscaping and building work to give you the perfect garden. There’s no replacement for safety and functionality, but we’ll also ensure that your garden is beautiful!